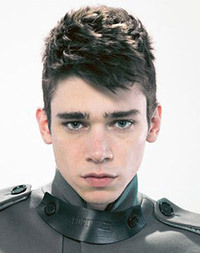 Cole Mohr was born in Houston, Texas, U.S., on April 27, 1986, is an American male model. He began his modeling career at the age of 18, in ad campaign for Dior Homme. He is one of the top-earning male models on the Forbes list. Become the face of Alexander Wang in 2007. He is favorite model of French photographer and fashion designer Hedi Slimane. Lives in West Village, New York City. He made his big screen debut in drama comedy film Momma's Man (2008) in role as Teen Boy 1. He appeared in thriller drama film Disconnect (2012) in role as Cole. Love, GQ China, V Man, Grey Italy, Another Man, 10 Magazine, Mixte, i-D, Oyster, L'Officiel Hommes Korea Cover, Commons & Sense, Bite Cover, Supplementaire, Essential Homme, Arena Homme +, Dazed & Confused Japan, Dansk, Fiasco Cover, Wonderland, Vogue Italia, Masquerade, Commons & Sense, GQ Style UK, Rolling Stone Italia, Tush, I Love Fake, Black Book, Indie Magazine Cover, City Magazine Cover, The New York Times Style, Contributing Editor, Man About Town, Vogue Hommes Japan, L'Officiel Hommes Singapore, Sportswear International Cover, W Magazine. AllSaints, Marc Jacobs, Marc Jacobs, Customellow, Kenneth Cole, Farah, Levi's, Moussy, Tommy Hilfiger, Barneys, H&M, Costume National, Buckler, Thomas Burberry. Walked runway for Helmut Lang, Eckhaus Latta, Skingraft, Bottega Veneta, En Noir, Dries Van Noten, Boris Bidjan Saberi, Public School, Maison Margiela, Moncler, Ann Demeulemeester, Antonio Azzuolo, Louis Vuitton, Haider Ackermann, Alexandre Plokhov. Represented by agencies Bananas Paris, Request Model Management NY, d1 Model Management London, Bon Image Corp. Tokyo. I am way ahead of everyone and my style is super good and smart. I figure no one would expect that I lived on a boat in Mexico for a year, I guess. Tom was one of the most special and kind people I have ever had the good fortune to meet and it is truly sad that he is gone. Having been a model has had absolutely nothing to do with anything related to the art world for me.